Fighting Ko is also the title of a Yutopian Go book by Jin Jiang, published in 1995. 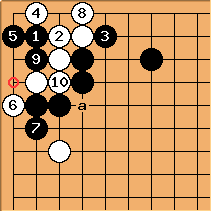 It is a collection of ko positions and problems. See fighting ko if this is not what you were looking for. Velobici: The core of the book are the examples that show how one side can force the other to accept a local loss or accept a serious ko fight. There are about 40 examples, called models by the translator, in Chapter Four. 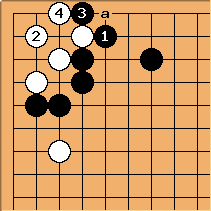 The move sequence that leads to the examples is often shown. The sections on capturing races and counting liberties in Chapter are wonderfully clear and useful. Unfortunately, the answers to the problems and examples in all but Chapter Six follow immediately after the problem diagram. 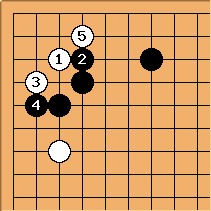 Note: the diagrams in the text all start from the same move. 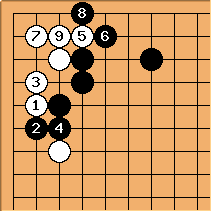 Here the starting move has been changed as needed to work with the move number display limitations of this wiki. and are common measures taken in invading this kind of position in the corner. How should be played? is an attempt to capture White by brute force. is necessary. is a skillful move that shows experience. If Black plays atari against , White will connects at springing a trap. In the case that Black loses the ko here, and White cuts at a, Black's wall collapses. The hane of is appropriate. White can only try to live in ko with . 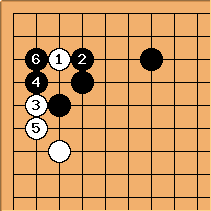 Although Black will still be damaged if the ko is lost and White captures at a, the situation is much better than in Diagram 10a. White attaches underneath at here avoiding the possibility of ko in the corner. This way, Black gets the corner and can be satisfied. On the other hand, White has sente and has made profit, which would be big in the endgame. and go after outward influence. White's corner is large. The pluses and minuses of this exchange depends upon how it works with the rest of the board. Is the Go level of the Author of this book actually known? Is he a professional or an amateur? If anyone has information about "Jin Jiang" it'd be nice if he could share them on the SL page linked to his name.